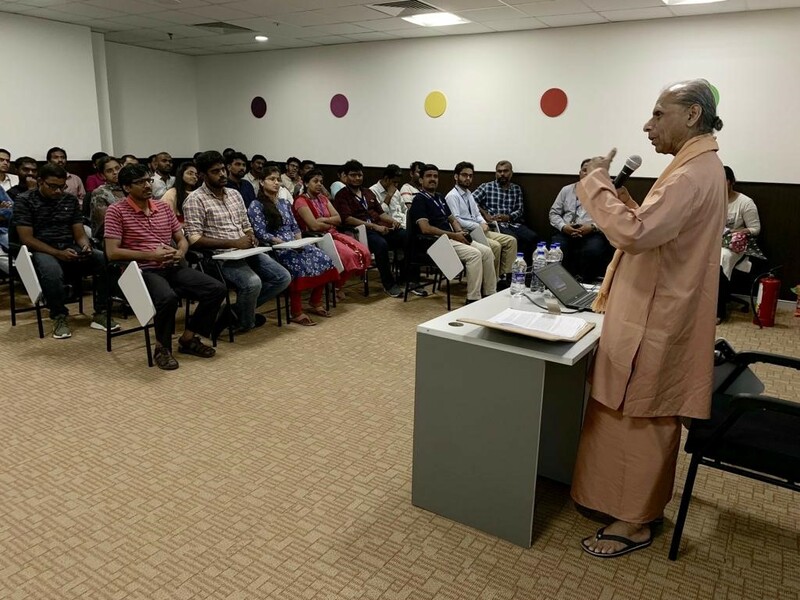 Yogoda Satsanga Society of India, Chennai Kendra in association with Trimble conducted a Talk on Meditation – The Key to Success by Swami Suddananda Giri at the office premises of Trimble in TIDEL Park, Chennai. The event was attended by 60 employees of Trimble and special guests, Dr. Sanjay Tyagi, Director STPI (Software Technology Park of India) and Mr. Gokulakrishnan, Deputy Director STPI were present. 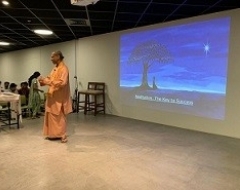 Swami Suddananda Giri addressed the audience on how to achieve all round success and lead a balanced life through Yoga. Quoting several verses from the Bhagawad Gita, Swamiji explained the importance of doing action, by first being established in Yoga within and that true success can be gained only through moderation in everything.He shared Paramahansa Yogananda’s curriculum for all round self-development that includes body care, mental engineering, social arts and applied spiritual science and shared intuitive quotes from the Autobiography of a Yogi to illustrate Sri Yogananda’s teachings. The talk included a Meditation break! Swamiji led the group with simple energization techniques, pranayama and visualization and shared 10 practical tips from Sri Yogananda’s curriculum on How to Free yourself from Tension.This was followed by an interesting Q&A where Swamiji engaged with the group on a variety of questionson Karma, free will, destiny, success, and meditation. The audience was enthused to know more about the teachings of Sri Paramahansa Yogananda. Information about how to enroll for the latest edition of lessons and become a member of YSS was shared. A free copy of the eBook (in 5 languages) and the recently released Audiobook (Tamil) of Autobiography of a Yogi was made available to all.